Last week we spoke to photojournalist Louis Leeson about his experiences documenting search and rescue missions in the Mediterranean. Louis also shared his thoughts on the important role of photography in capturing these events and the perverted politics going on off camera. What were your expectations before starting on the "Search and Rescue Zone" project and how did this change during and after being out on the water for a month? I knew well what to expect: traumatised men and women, frightened children, exhausted aid workers. I had photographed many of the steps in the new Odyssey taking place around the Mediterranean: in Lebanon, in Jordan, the border of Syria, and elsewhere, but I had not seen the search and rescue operations on the southern edge of Europe. Perhaps what I didn’t appreciate before going aboard the vessel was quite how politicised the nature of search and rescue had become in Italy. Even as a journalist following the story closely, seeing first hand the hostility from Italian politicians and the media directed at the crews operating humanitarian missions between Sicily and Libya, was a shock. Accusations of collaboration with traffickers came from the judiciary. Undercover agents from the intelligence services infiltrated the crews of search and rescue vessels, including one I spent time aboard. Never has the act of saving another human life carried such a burden of suspicion. Given that context, the work the crews of the search and rescue vessels did was nothing short of heroic. Despite the acrimony back in Europe, the aid workers created a space that people they rescued could feel safe in and enjoy relative comfort. Within the series there are some very distressing scenes, did you talk much with those on board about the pictures you were taking and what you were witnessing? On board the ship you would see a lot of difficult moments. The rescue operations are incredibly delicate and dangerous. Frightened people panic and fall in the sea. Traffickers use unseaworthy boats that collapse and fill with water. The dangers of crossing the Mediterranean are very real and we will never know the true number of those who did not survive. This goes some way to telling you what goes on in the chaos that is Libya. If they will risk this, what must they be leaving behind? Those stories from the people I photographed stay with me as much as the images, if not more so. As a journalist covering the humanitarian consequences of war and social upheaval, you are often very far from home. The cognitive dissonance of covering a story that involves people fleeing war, torture, and worse, inside Europe can be tough. As a photographer I know the most important thing I can do for those crossing the sea is to tell the story as truthfully as I can, as I see it. But reporting the refugee crisis in Europe is unlike other stories because it is not possible to remain only an impartial observer. There are occasions where you must help those around you in immediate need, offer a hand instead of taking the picture. Many of those I met working on the ships in the Mediterranean and the Aegean I count as close friends, we have stayed in touch. How important is it to you to be there 'on the ground'? I think all photojournalists chose the profession because they recognise the importance of having someone present in the story that is being reported. It is not good enough to have just the words and the statistics: we must see the faces of the people we are talking about. We are given an accurate picture of the refugee story in the news. There are an incredible number of good journalists and photographers dedicated to covering this story. But the commentary has become callous and devoid of consequence. You cannot say “Close the ports” without also saying that doing so will lead to tragedy and suffering, all of it avoidable. Italy receives the largest number of migrants and refugee arrivals, 150,000 in 2017. With a new Italian government, that might be about to change. It has been said before that the migration crisis is not a humanitarian crisis at all, but a political one. As Italy closed its ports to search and rescue vessels the French government criticised the move, but it also declined to allow the 600 people stranded at sea to disembark at any of its ports. What Europe needs is more solidarity between nations to respond to the numbers of people arriving on the southern coasts, which is why the Spanish government’s recent decision to allow the Aquarius to call at Valencia offers a glimmer of hope. But the journey from Libya to Spain kept more than 600 frightened people on ships with limited resources for more than a week unnecessarily. This is incredibly dangerous. Medical services on board are limited and stretched to breaking point. Tired, hungry, and scared people with little space present a serious crowd control issue. It is a testament to the character of the crew on board the Aquarius that they could reassure everyone they would be safe and keep spirits high. 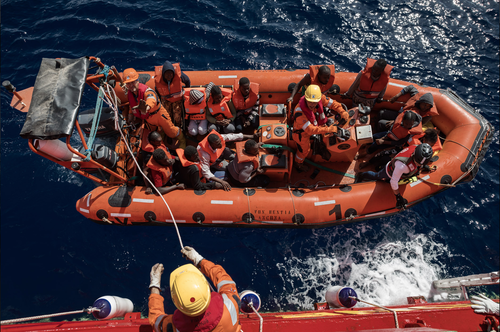 The long journey also meant that the search and rescue zone off the coast of Libya was without one of the larger ships and one of the most experienced crews. The decision not to allow humanitarian vessels to disembark in Italy will cost lives, how many we are yet to see. Open the ports! To see the full series of pictures taken by Louis go to http://www.louisleeson.com/photos/mediterranean/ We urge you to explore Louis' other works as well!